Alastair Cook never looked like the sort of man who would scare anyone. Too doe-eyed, too rosy-cheeked. Polite, well-mannered, as intimidating as a Sunday afternoon trip to a garden centre. For one glorious seven-week spell, however, he frightened Australians rigid. He was a bogey-man, a monster, a man who sacked their sporting cathedrals and then ruined Christmas. Whatever else he did in his career, for all the other records we might look back on fondly in his retirement, you have to start and finish and wallow in the Ashes of 2010-11. If you were there you were lucky. If you were waking yourself up early on an English winter's dark morning to check the scores, you often found yourself making colossal misjudgements. Right, Cook's batting again, and he was batting when I went to bed, so have we followed on? The only thing following on was one relentless score after another - 67 in the first innings in Brisbane, a preposterous 235 in the second, 148 in the second Test in Adelaide, 82 at the MCG and a withering 189 in Sydney. The main reason why he didn't score more was that his 766 runs kept laying the groundwork for Australian innings defeats. He couldn't bat again because he had already scored so many runs he didn't have to. It was beautiful because it was unprecedented and it was preposterous because of what had come before. 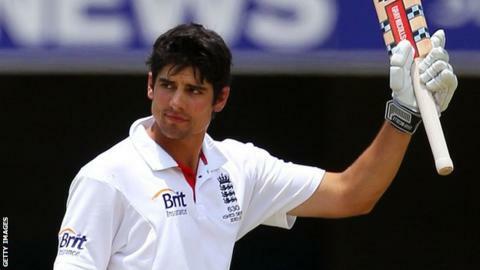 In a streak of eight Test innings the previous summer, Cook had scored 7, 23, 29, 8, 12, 17, 4 and 6. He averaged 13. In 19 previous innings against Australia he had managed only a solitary century. England hadn't won a Test series down under in almost a quarter of a century. If you had mentioned a cricketing Don in the same breath as the Essex opener in the summer of 2010 it would have been Topley. By the start of 2011 it could only be Bradman. With respect to the former county seamer, that ranks as quite the sporting metamorphosis. It hurt the Aussies more because they couldn't quite work out how Cook could be so destructive. He appeared to have not so much a range of scoring strokes as four of them: a straight push-drive, a cut, a clip off his legs and a rolling wristy pull. Kevin Pietersen's threat was obvious. He decapitated bowling attacks. In a world of demolition men Cook was instead an archaeologist, patiently reconstructing an ancient structure for Test innings. Dig in. See off the new ball. See off another new ball. Pietersen produced the most outrageous single score of that series with his pillaging 227 at the Adelaide Oval. He also scored less than half as many runs as Cook across the series. If you were shown an over from KP's double-century you would have a rough idea in which 50-run block it might be taken from. Cook's first run often looked exactly like his 99th, or his 160th, or 220th. What made 'super man' Cook an icon - and is he irreplaceable? It drove the Australians slowly mad. This was what they had always done to England in an Ashes series: find someone previously slightly underperforming and turn them into an indomitable destroyer of home dreams. Steve Waugh in 1989, hitting 177 not out in the first Test and 152 in the second for an average, at one stage, in excess of 250; Mark Taylor, another left-handed opener, scoring 839 runs across the same series; Terry Alderman, trapping Graham Gooch lbw with such predictability that it may as well have been a looped replay of the same delivery; Matthew Elliot in 1997, scoring 556 runs at 55, almost half the runs his entire Test career would produce. As Cook unobtrusively did the same to Australia that winter he took us with him into some surreal parallel universe where everything was the exact opposite of what you had come to expect. England were losing the first Test at the Gabba, as they always do, until Cook and Andrew Strauss walked out to bat in their second innings. They trailed by 221 runs on the first innings. By the time Cook called it quits they had scored 517 runs for the loss of a single wicket. Records were broken and records were reset. Cook first went past Ian Botham's mark for the highest Test score by an Englishman at the Gabba and then Bradman's score as the highest by any player in Tests at the ground. He became only the fourth Englishman to score an Ashes double century in Australia, although that seemed a bit tame compared to some of the other stuff: batting longer - for 630 minutes - than any Englishman in history down under, including those who played in timeless Tests. It was the first time in Test history England had passed 500 for the loss of only one wicket; his second-wicket stand with Jonathan Trott was highest partnership by any visiting team at the Gabba. Those were the numbers. The visuals were almost as striking. The Gabbatoir had been heaving across the first three days, a mess of half-cut Queenslanders baying for English blood. By the end it was deserted, save for an occupying army going more barmy with every landmark. The seats in the ground are green, yellow and purple, designed so that the stands look busier on quiet days than they should do. When Strauss declared - which was probably the only way anyone was going to stop Cook from scoring even more - his opening partner walked off waving to them anyway, as if taunting all those who had left and run for cover. A Monday morning in a frozen northern hemisphere November had seldom seen so much gleeful pillow-punching or leaping around. And it was to continue across December and January too. In Adelaide, where Cook notched up a near-comical 1022 minutes without being dismissed, Aussie fast bowler Doug 'The Rug' Bollinger might have torn his hair out had he not paid so much for it. Captain Ricky Ponting, gone in his own first dig for a golden duck, lost his rag very visibly as inevitable defeat followed. It became the scene of a Boxing Day massacre. Australia, bowled out for 98, their lowest first innings score at the MCG in history, even worse than the 104 they posted in the first ever Test back in 1877; Cook - who else - unbeaten at stumps with England 157-0. Three days later, England wrapping up another innings victory, another bastion had been transformed into a slice of English sporting paradise, the indelible image this time of Cook and his team-mates standing in front of their massed ranks of supporters doing the Sprinkler. "WHAT A SPRAY" was the banner headline over the photo on the Herald-Sun's front page the following morning. "Just when you thought the cricket couldn't get any worse, we had to endure this!" It did, of course, get worse for Australia, when one more behemoth from Cook's bat built the foundation for another crushing defeat in the final Test in Sydney. They hadn't lost three Tests at home in 22 years. They hadn't lost by an innings on Australian soil for 17, but had now done so three times in four weeks. Cook was not the only factor in that series. Trott was the number three England had always wanted and still do. James Anderson took 24 wickets. Ricky Ponting averaged 13, his vice-captain Michael Clarke less than Graeme Swann, England's number eight. While Swann took 15 wickets, Australia's three spinners took just four wickets between them for an aggregate 556 runs. But Cook was the dominant one, man of the series, bashful king of all he surveyed. "An amazing seven weeks," he said at the end. "If someone had told me I could do this I'd have laughed in their face. I think it's going to take me a while to get over this." Arguably he never did. What we didn't realise then was that those Ashes were a peak he would never scale again. While there were brilliant individual innings afterwards, two home Ashes series won as captain, maybe the ultimate record of all as England's greatest ever run-scorer, it was that winter that will forever define him. You could find a sadness in that if it hadn't all been so wonderful. If there was a decline it was only because the summit was so high. The views from the top we will never forget.